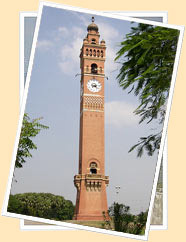 Lucknow city is the capital of the state of Uttar Pradesh. Read on to know more about travel and tourism in Lucknow city, India. Lucknow city is popularly known as the 'the city of Nawabs'. Situated on the banks of the river Gomti, it dates back to the time of the Suryavanshi dynasty. Lucknow, the capital of Uttar Pradesh, was founded by Nawab Asaf-ud-Daula. In the olden times, it served as the capital of the nawabs of Awadh and it is one of the reasons why it is also called as the city of the Nawabs. The era of the Nawabs bestowed Lucknow with the courteous culture as well as mouthwatering delicacies for which it is famous today. Travel to Lucknow with us to find more information on this interesting city! The city of Lucknow has a magical charm surrounding it. Be it its delicious cuisine or its heart melting culture, the city leaves an everlasting impression on its visitors. It is one of the few places where one can still find people saying 'aap', 'janab', 'pehle aap', etc. Even though flats have replaces Nawabi mansions, the city is still as charismatic as before. So, visit Lucknow and lose yourself in the magic and allure of the city.